Collaborations is a compilation album released by Irish singer Sinéad O'Connor in 2005. The album contains songs recorded throughout O'Connor's career on which she collaborated with a variety of artists, spanning several different genres of music. Many of these tracks appeared on the albums of the artists with whom O'Connor performs. The tracks "Empire" and "Heroine" also appear on So Far... The Best of Sinéad O'Connor, released in 1997. One Track (Monkey In Winter) had never been never released on CD before, and was previously released as B-side on a 12" only. The album sold 500,000 copies worldwide. 1 2 "Critic Reviews for Collaborations". Metacritic. Retrieved 2013-01-03. ↑ Gilstrap, Andrew (2005-07-08). 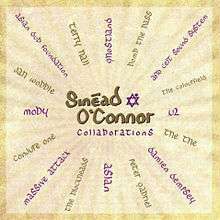 "Sinead O'Connor: Collaborations". PopMatters. Retrieved 2013-01-03. ↑ Voyer, Robert (2005-10-01). "Sinéad O'Connor : Collaborations". Splendid Magazine. Retrieved 2013-01-03.